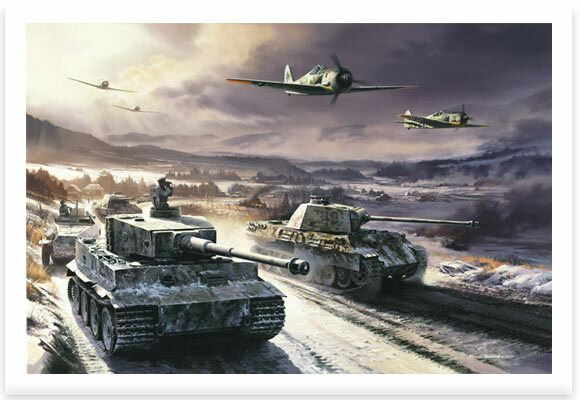 The bitter Russian winter of 1943/44 was matched by some of the toughest fighting of the ground war. Between the Carpathian Mountains and the Dneiper River elements of the 1st SS Panzer Division Leibstandarte SS Adolf Hitler reinforced their fearsome reputation. Panthers of SS Pz.Rgt. 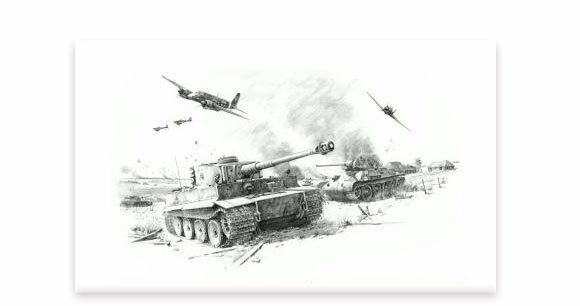 1 move forward to engage Soviet armour,passing a Tiger of the 13th Heavy Comapany LAH.Overhead, Fw190A's of Hptm Erich Rudorffer's II/JG54 lend support by hunting for Soviet ground attack aircraft ahead of the panzer spearhead. *Erich Rudorffer KC, Oakleaves and Sword, *Hans-Ekkehard Bob KC, *Hugo Broch KC.